Steelers Resign Justin Hunter. Has Pittsburgh Wrapped Up Free Agency? 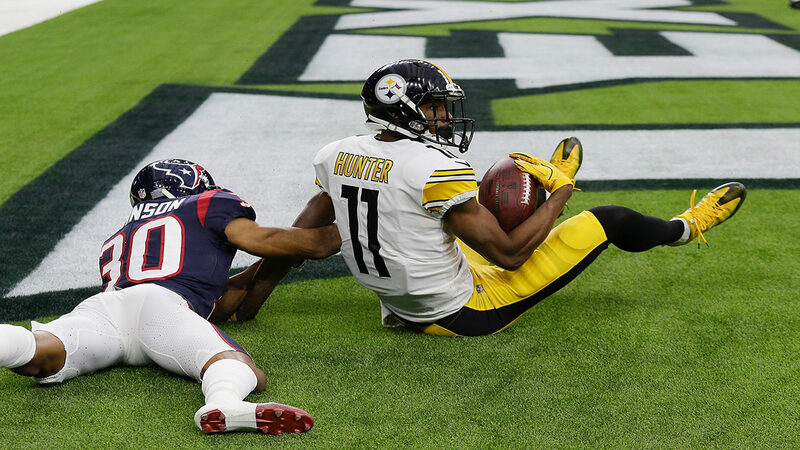 Capping off a busy week of low-level free agent activity, the Steelers resigned Justin Hunter, their reserve wide receiver. And with Justin Hunter‘s contract in place, the Steelers could very well have wrapped up their free agent activity for the year. Thus far, the Steelers have resigned Fitzgerald Toussaint, Daniel McCullers and Stevan Ridley all of whom were unrestricted free agents. That leaves Sean Spence, Arthur Moats , Greg Ducre (who? ), and the injured Eli Rogers as the Steelers only unrestricted free agents on the market. Neither Sean Spence nor Greg Ducre would appear to be in the Pittsburgh’s plans, and at this point their chances of getting an invitation to St. Vincents likely hinge on the Steelers inability to land depth late in the 2018 NFL Draft. The Steelers chose not to extend a restricted free agent tender to Eli Rogers, but are believed to be interested in bringing him back once he recovers from his ACL injury. Arthur Moats presents a more interesting case. As we pointed out in our free agent profile of Arthur Moats, no one is ever going suggest he’s a superstar. Yet Moats has delivered whenever the Steelers have called his number. But Moats is turning 30 this year, the Steelers have Keion Adams returning from IR, and could well select an outside linebacker early in the draft. Justin Hunter had a quiet 2017 campaign with the Steelers only appearing in 7 games, getting 66 snaps or just ender 6% of the offensive snaps. He did catch 4 passes, including the touchdown pictured above. The Steelers wide receiver depth chart is set with Antonio Brown, JuJu Smith-Schuster and Martavis Bryant at the top. Darrius Heyward-Bey doesn’t figure to push for time and will have to prove himself on special teams to keep his roster spot. Eli Rogers’ injury would seem to open the door for Hunter, who is said to excel in practice and has earned the trust of Ben Roethlisberger. This entry was posted in Steelers 2018 Free Agent Focus, Steelers 2018 Off Season and tagged Fitzgerald Toussaint. Bookmark the permalink. Steelers 2018 Running Back Draft Needs -Time to Seek Le’Veon Bell’s Replacement?